qualitycollectiblecoins has no other items for sale. RARE DOUBLE CURVED CLIP MINT ERROR NGC AU55 1999 D Connecticut State Quarter!! Free shipping on all eligible items from qualitycollectiblecoins. $0.00 shipping for each additional eligible item you buy from qualitycollectiblecoins. We accept PayPal. We charge 7% sales tax for items shipped to New Jersey. This coins are brilliant and mirror-like. They look like they just rolled off the press: and they come protected in cellophane wrappers. 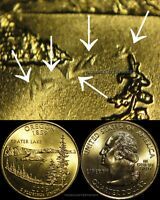 Extremely fine detail, as a proof quarter ought to be. It's a wonderful addition to my 1970 proof coin set collection. Thank you morris779 for sending it.